LUKE 8:22-39 -- "ONLY REASON"
While reading Luke 8 recently something kicked in. The thoughts took me back to Uganda. When in Soroti, God dropped a young girl into the lives of me and my co-"minist er" Jill. 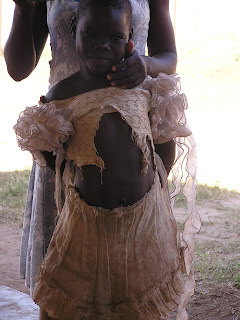 An aid worker for a Ugandan organization wanted to help in the girl's situation, but couldn't, and she laid it in our lap. When we followed through, our lives changed. She was at the local hospital caring for her brother ... she was guesstimated at 12, and he was 14. He died the next day. Her parents had died and other family members couldn't help. After his death, the local authorities gave us permission to take her back to the orphanage with us, and we left for Christmas break the following week. The assumption, on all of our parts, was that she would be added to a family group home. That changed before we reached the orphanage. My Ugandan son and daughter-in-law, Sam and Adhe, picked the three of us up in Kampala, a couple hours from New Hope. 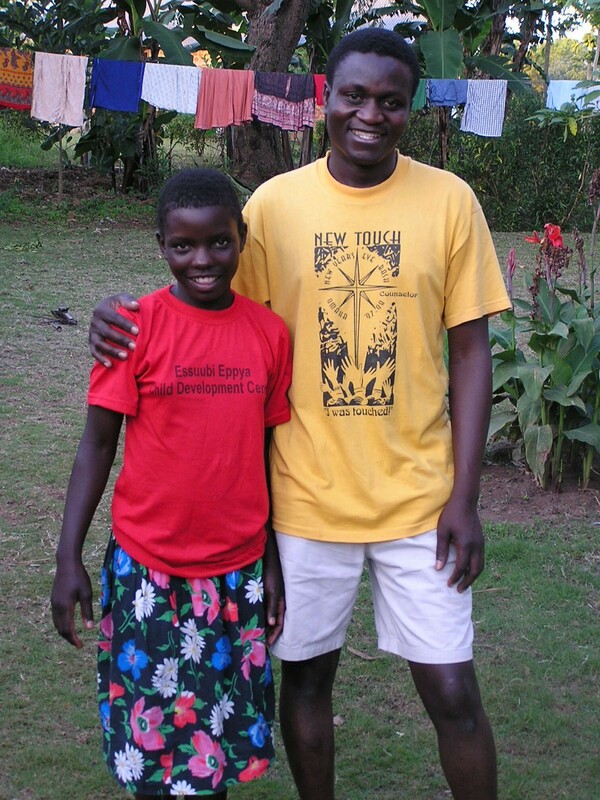 Before we reached there, Adhe had "adopted" the girl ... and for six years, she has lived in this family. Her whole life changed: From -- little or no education, no daily care, ragged or nearly non-existent clothing, little food, no medical care, and working incessantly to the bone because of the others' expectations and her servant-heart attitude. To -- a good education, good food and nice clothes, medical care, and a totally sold-out mother and father, and young sister, an "Aunt" Jill, and piles and piles of friends. And, yes, she still does chores, but not in the harshness of her former life. Before we reached New Hope that evening, Adhe had changed her name from something informal and "nick-namey" to Rebekah. When we discovered this the next day, Jill wanted her also to be called "Sanyu" because it means "joy" and we saw it flowing from Rebekah constantly, even when she was in the hospital caring for her brother. I presented that idea to Adhe, and she immediately applied it and "our" girl is Rebekah Sanyu. The reason I'm telling this is because when I returned home several weeks later, I was very sick... Post traumatic stress from what I'd seen and heard in that refugee area; many physical problems connected to exhaustion, malnutrition, sleep deprivation and malaria; emotional residue from the separation from my husband, having spent 2-1/2 months without him, except for the occasional phone call [he came the last two weeks, which caused great rejoicing among many, and my heart could relax again]; AND the overall cost for that 3 months came to approximately $6,000, not exactly a "cheap date." A few months later Sam and I were talking on the phone. I was feeling better, doing OK. And I said to him, "Sometimes I think the main reason the Lord called me to Soroti was to get Rebekah and give her to you." My son, knowing all that we had gone through, and not taking any of it lightly, said he agreed and ended with, "... and it was worth it." NOW -- Luke. This is the part that shares the boat trip across the Sea of Galilee. The storm tried to wipe them out, the disciples panicked, and Jesus commanded it to quit. They reached the Gerasene area and were confronted by the demonized man, etc., etc. [The story is well-known, of course.] At the end, the local villagers tell Jesus to leave. As the Message Bible puts it: Too much change, too fast, and they were scared. When I was reading it a few days ago, for the very first time ever my mind popped in a thought... the demonized man was the only/main reason Jesus made the trip across the Sea of Galilee... the attempt of the "Storm" to kill Him and his disciples, the fight with the demons [which may well have shaken the disciples up, and most certainly scared the townsfolk and herdsman to the nearly insane level], and the physical tiredness that could well have hit the "man" side of Jesus afterward --- it was ALL for the sake of this ONE MAN. To free him and give him a future and a hope. And open the eyes of those around him, who had feared and avoided him, to truly "see" ahead. ...Just as going to Soroti, "finding" Rebekah, and in spite of all the challenges, the "revelation" that SHE was the reason for the trip, and she was worth it! 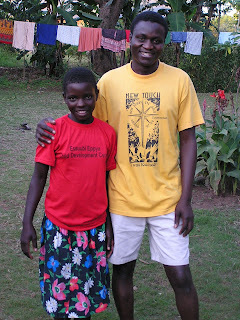 Here's a photo of our dear granddaughter, Rebekah Sanyu, and our son, her dad, Sam, a couple days after she reached the orphanage ... in her real and bright "kid" clothes [nothing compared to the large "old woman" dress she was wearing when Jill and I met her a week earlier]. The where does it begin – or end-ness? Numbed by life’s trickery, treachery. (Period. He is the Eternity-Focused Eternal Father). the oil of joy for mourning). He will not leave gaping ugly Holes). My Dear, Most Dear, Husband loves me. --– a Future and a Hope. ravaged edges bound in Love. Serious stuff. [Just thought I'd warn you.] I have 4 prayer booklets based in the Far East -- Thailand, Malaysia,Tibet, North Vietnam -- sent to me about a year ago by Lee, my Singapore friend. This morning I began reading, for the severaleth time, the booklet about people in Thailand, with many details about their lives and what they must go through on a day-to-day basis for survival. It also shares how nearly impossible it is to present the gospel to them for several reasons: it's illegal in various locations; a high percentage of illiteracy; generationally sold-out to idols, most of them having been dedicated from the womb, their spirits captivated. Over these months, while reading the stories, I have become more and more heart-involved. I turn a page and see a familiar picture of a "friend". Even before I begin reading, I recall their unique situation. I have become spirit- acquainted with them. I realize I will never meet these men, women and children face-to-face here on earth -- but maybe, just maybe, miraculously, we will meet in heaven. The reason? Because many are standing up for them, some "tent-making" within their national borders and others who, through prayer and fasting, worldwide, are fighting for their salvation. As I look at the photos and read the stories, I find myself praying in a way that has become nearly standard for me over this past couple of years. Of course, first I generally say or "do" all the stuff that, as a Christian, is normal ... expected, but there is only one phrase that comes forth frequently with real intensity... "Only You, Lord, only YOU!". It's focus: various personal and family and friend situations, the violence in our neighborhoods, our city, the ungodliness that permeates our state -- our region -- our nation ---- our world -- and topping those, my own personal "flaws" that seem to keep kicking my tail. When I find myself concerned beyond belief -- some folks have said I'm concerned beyond my "faith" -- this is the only prayer I can pray. It is screamed in my spirit and heart ... and often from my mouth -- while walking through my house or driving my car around town or through other parts of the country ... and, yes, oh, yes, jumbled together with praise to our Lord. AND In spite of that truth ... knowing that He IS the answer ... I still. ... overall ... often ... frequently ... cry out, "Only You, Lord, only YOU!" "And what did you accomplish?" "I made it through shorthand." Takes not just skill, but time. The hours sift like sand. Our friends all think we're crazy. No one can say we're lazy. To each other -- and to shorthand. stay down!" or "Shirley, off the chair!" It reminds me that 'Surely goodness and mercy will follow me'." And she trailed into a laugh .. which I joined. In Luke 15, Jesus tells the story of the lost sheep and the lost coin and how the "finder" rejoices. WELL, I don't have any sheep and my coins aren't valuable enough to cause me to panic at first and rejoice later. We live in a different world today, in general, for that response. Today I panicked over a totally different loss. My driver's license. I had it in my pants pocket this morning, thought I moved it to my purse later, and, assuming that was correct, when I was leaving to pick up the g-kids from school, tried to pull it out to pop it back into my pocket. I couldn't find my license. I freaked. I tore the purse apart, I dug through my jacket and pants pockets, hoping it had been stuck in a fold. I didn't find it, but had to leave right away or I wouldn't be at school on time. Later I looked under car seats thinking it might have fallen out of my pants pocket earlier in the day. Nothing. When I got home I dug through the sofa and chair in the living room and my chair in the office. Nothing. I called the one place I had been that day, a restaurant, in case it had been found there. NOTHING!! So, I knew that tomorrow I would have to go to the DMV to get a new one -- not pleasant, partly because it would hit the budget a bit, and with Dave out of his job for a year and a half, extra budget hits really hit me in the stomach. This evening I needed to clean the living room. On today's "to do" list. Was "swiffering" -- no expectation whatsoever re: the license. Started to swipe under a cabinet and ran into something and when I pulled the duster out, the license came with it. I jumped up and down, hollering "Thank you, Jesus. Thank you. Thank you." And the frustration? I couldn't run outside and find neighbors to rejoice with me. It was dark, it's cold, most of them are "indoorsy", especially this time of year. But this scripture ran through my head and I decided that the best ones I could share this with are ones who would rejoice with me -- some neighbors might, but the majority of them would probably just roll their eyes at me, "that crazy, over-reacting intense woman." Isn't it rather nice to discover, one more time, that the stories Jesus told can adjust themselves to our cultures and have the same dramatic results? So, friends, "Rejoice with me, for I have found the 'silver coin' that I had lost." One small portion of the learning curve has been overcome. I finally figured out how to change the top blog intro. The photo, taken back in the early '90s in Uganda at the New Hope Uganda orphanage at Kasana is one of my favorites. 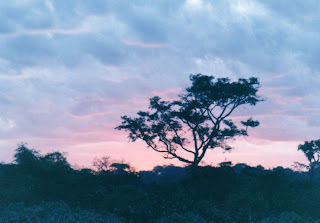 Amazingly, I took this photo, even though it was a sunrise -- which I rarely saw -- missing sunrises is normal for me. The tree wasn't perfect then and is now gone. But this photo represents the blessing of living in that country ... and is a constant reminder of our dear family and friends who will be in our hearts forever. I met my dear husband 25 years ago towards the end of February. I had been asked to write and direct monologues and speak "sermonette-style" at his church during the Lenten season. A recently divorced Christian, I was very aware, both personally and by observation, of the "less than" treatment the divorced experienced. W-e-l-l, I threw that concern into the mix, and sounded a bit on the defensive/aggressive side [WHO, ME???] when I pushed for hope that the divorced and their children, instead of being treated as outcasts and unclean, would be received as spiritual warfare "widows and orphans". Annoyed the heck out of a lot of folks. And, even though I was a guest speaker, surprisingly, the Lord led me to join this church. Dave was a youth leader ... and I had a youth. He was much younger than I was; I had no attachment to him except that I appreciated his generosity and servant-heartedness and kindness towards the kids and their folks... including me. Then on May 19th, the Lord “glued” us together in a way we never expected and certainly didn't understand. 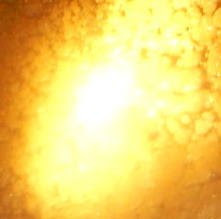 Both of us were big-eyed and scared beyond imagination at first – but we knew this was truly a "God-thing." Dave was a gentleman, thoroughly. I was the opposite, definitely not sweetness and light. I had been abused for most of my life and was intense, and, even though a Christian for 19 years, I still had a rep for hardness, toughness, bluntness, often aimed at fighting for others in abusive or tough circumstances. Two days after we were drawn together, Dave showed up at my door, handed me an envelope, gave me a quick hug, and left. When I opened it, and read it, I was absolutely floored. Since that moment, it has been framed, either actually or in my heart. I want to share it with you. It will let you know, and allow you to show others, that the Lord can break through for the worst of us in the worst of life's events — to bring glory to His name. Ain’t nothin’ else more important. I'm still a "bit" on the intense side, but after 25 years of love and acceptance from Dave, all I want is for others, especially the wounded or abused, to experience the Lord's compassionate heart — just as I have been blessed to do. We married 4 months later.